Join us in February for a discussion of Daniel Clowes's snark-tastic cult classic, Ghost World! We meet every 3rd Tuesday @ 7pm, so come on over and talk nerdy to us! Remind your cashier that it's for the book club, and get 10% off your copy. Daniel Clowes reads from Wilson. 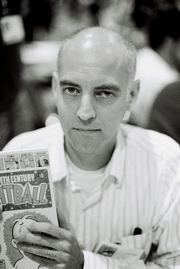 Daniel Clowes is currently considered a "single author." If one or more works are by a distinct, homonymous authors, go ahead and split the author. Daniel Clowes is composed of 6 names. You can examine and separate out names.